Kubrick Collection Packaging Damaging Discs? Reports from around the net peg the Blu-ray collection's packaging as a danger to your discs. While we're not averse to new and innovative packaging, it doesn't always work out. Take that awful 'Back to the Future' Blu-ray set packaging for example. It was so bad that Universal came out with instructions on how to use it, before they eventually changed the packaging altogether. 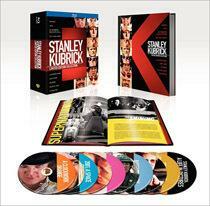 The new Stanley Kubrick Blu-ray collection is apparently suffering a similar fate. While there are few complaints about the movies themselves, the packaging isn't up to snuff. When pulling a Blu-ray out of the sleeve, you'll reach a point where the Blu-ray sticks and has to be forced out. While we've seen plenty of complaints about the less than stellar packaging, High-Def Digest reader Ari Bach says that his discs were actually damaged during the removal. "The packaging literally destroys every disc removed from it as intended," he writes. As requested, we're spreading the word. Is this an isolated incident where one person's packaging was significantly worse than others or are your discs getting damaged too? Please tell us what you've found! Thanks for the tip Ari!